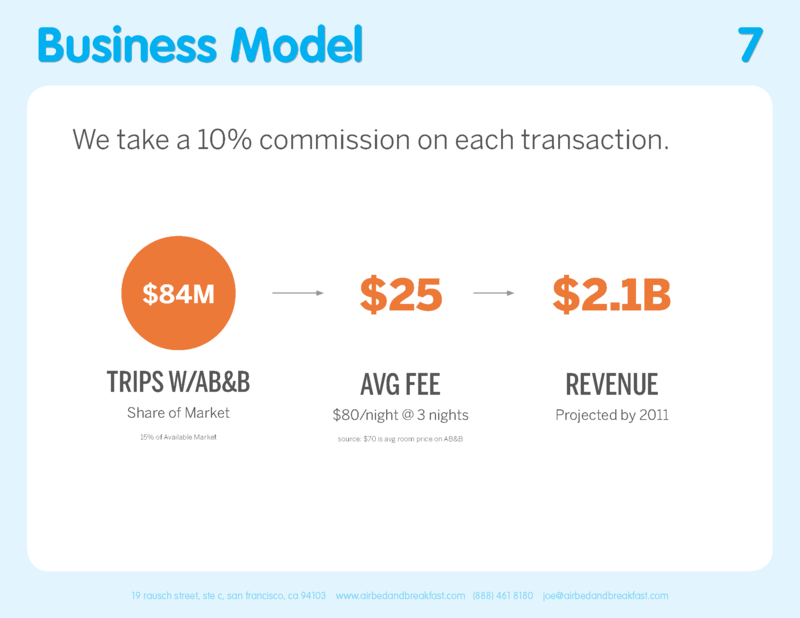 This is the Airbnb pitch deck to raise their $600k seed round. It is fairly basic, but it gets the point across. It took them a looooong time to raise. They also had NO idea what they were doing. They changed their market size from an ‘m’ to a ‘b’ as Sam Altman told them that’s what investors wanted to hear! So don’t think this deck is here to teach you anything based on them having experience! These guys were as clueless as you may be now. Actually, it’s not a bad deck tbh, you just don’t believe it (if you forget how large they are now). To see the collection of 92 pitch decks, head over here. 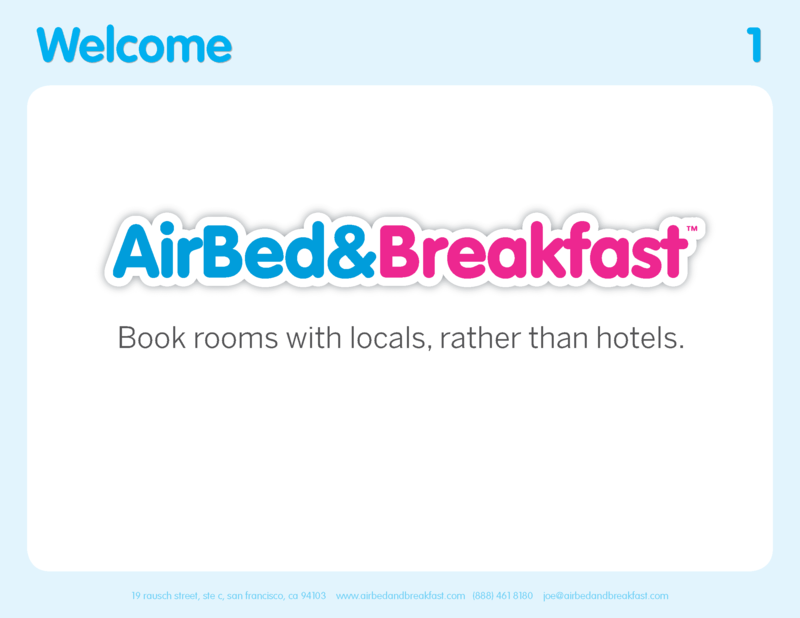 Haha, air bed and breakfast, who the hell is going to use that. It was ridiculous! Guess the joke is on him. Shows you how hard it is to pick some of these big winners as an investor! Airbnb is a two-sided marketplace that matches people that own real estate properties with people interested in renting short-term lodging. Founded in August 2008 by Brian Chesky and Joe Gebbia and based in San Francisco, California, the company was privately owned. By 2009, it had more than one thousand customers and by mid-2011 more than one million. As of 2015, it had over 1.8 M listings in 34,000 cities around the world. Airbnb is a community marketplace for people to list, discover and book unique spaces around the world through mobile phones or the internet. Whether an apartment for a night, a castle for a week, or a villa for a month, Airbnb connects people to unique travel experiences at any price point. 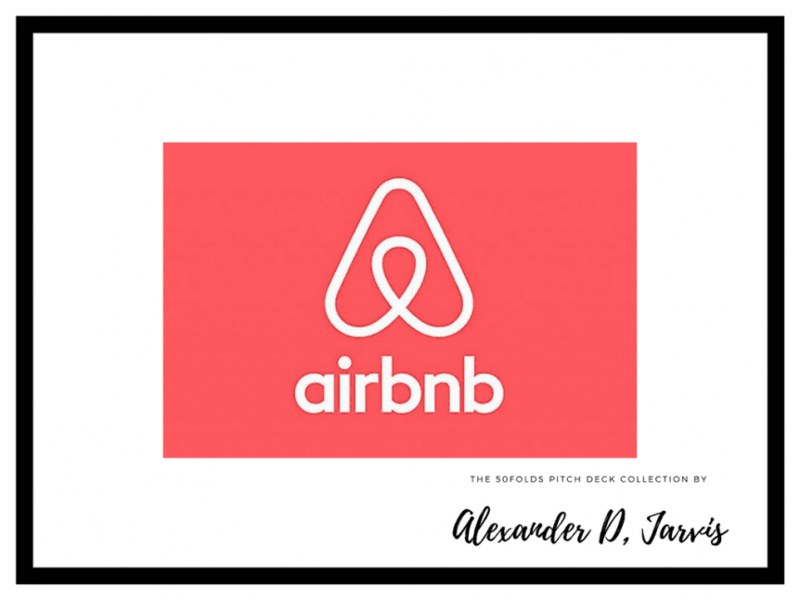 With a growing community of users, Airbnb also provides an easy way for people to monetize their extra space and showcase it to an audience of millions. 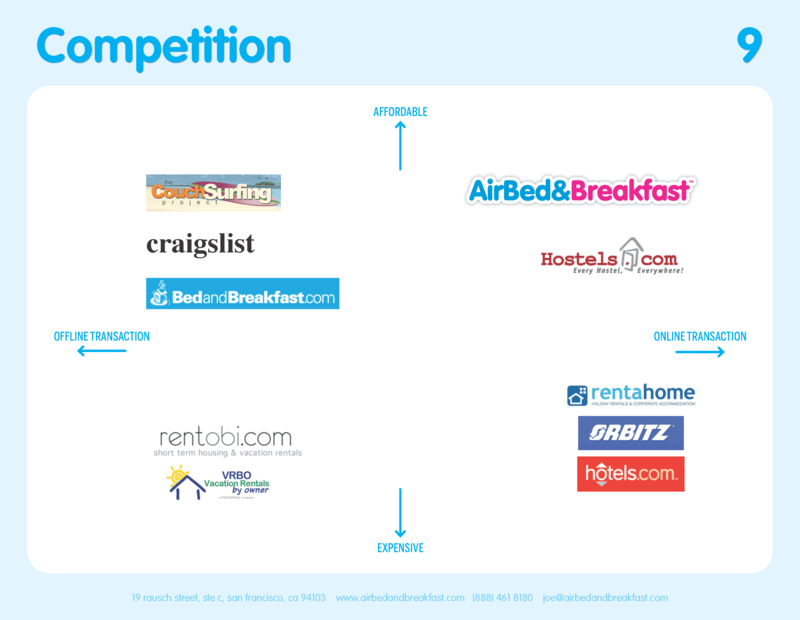 Airbnb has acquired several of its competitors, including Accoleo, CrashPadder, NabeWise, and Localmind. In 2008, after hosting their first three guests in their San Francisco apartment, Gebbia and Chesky began receiving emails from people around the world requesting Airbnb in their own cities and in places they would like to visit. As Gebbia put it, “People told us what they wanted, so we set off to create it for them.” Indeed, much of Airbnb’s growth could be attributed to the fact that people asked for the service Airbnb offered. You may have heard of ‘do things that don’t scale.’ This lead to the Airbnb photography program. The photos were really bad. People were using camera phones and taking Craigslist-quality pictures. Surprise! No one was booking because you couldn’t see what you were paying for. Instead, they rented a $5,000 camera and went door to door, taking professional pictures of as many New York listings as possible. 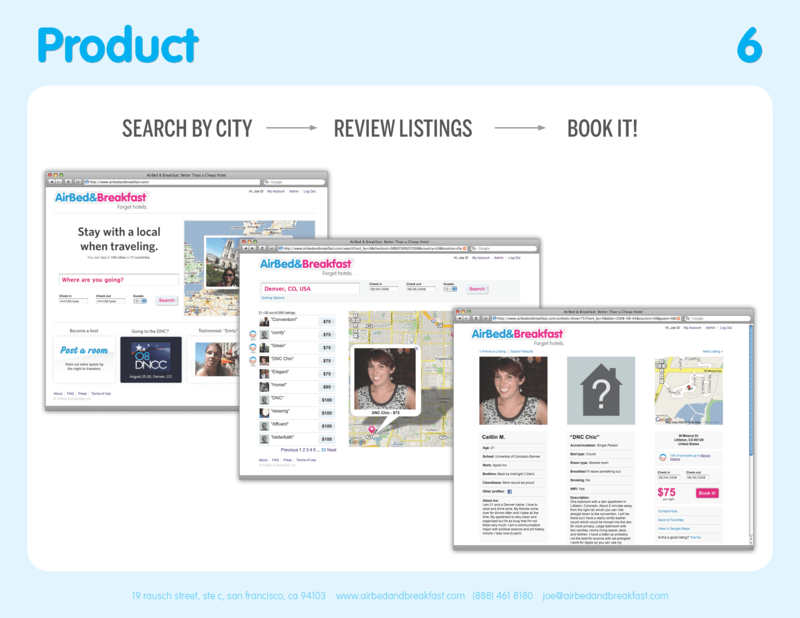 This approach led to two to three times as many bookings on New York listings, and by the end of the month Airbnb’s revenue in the city had doubled. As it turned out, what drove stunting growth in New York also helped in Paris, London, Vancouver, and Miami. Though this initiative was not cheap for the cash-strapped startup, the founders felt that the long-term benefits—improved listings were two and a half times more likely to be booked—were well worth the cost. 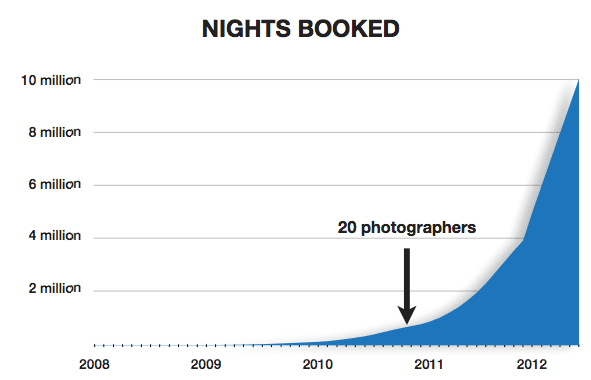 By 2012, there were more than 2,000 freelance photographers employed by Airbnb to photograph 13,000 listings on six continents. We start with the perfect experience and then work backward. That’s how we’re going to continue to be successful. This approach extended beyond revamping listing photos. The founders looked at the characteristics users valued and worked to engineer those into the entire site. With initial traction, came new scrutiny from the media and the established hospitality industry. I find this image fascinating! Your first slide should be just your logo and a tag line. Investors get a lot of decks, so being told exactly what they are about to read is very useful. You want to use no jargon and get to the point. “Book rooms with locals, rather than hotels” is not a bad tag line. It doesn’t explain exactly, but it is definately intriguing. I want to know more. Who is going to send you a letter? I personally think at most you add your name and your email on the last slide. I recommend a pretty photo of you too since it humanises you. God knows when you see 1000 pitch decks you get something like ‘banner blindness’ applied to decks. Imagery puts a face to the deck. You got a warm introduction to your investors, so they know of you and your email already, right? It’s in their inbox… that’s what they are going to respond to. I don’t think you even need to add contact details, but it doesn’t harm you so long as it doesn’t distract. This slide is fairly good practice to copy. You don’t need a page number on the first slide, or interstitial slides though (Nor to add ‘welcome’). Depending on your narrative (Take the pitch deck thinking course), the problem is generally a safe place to start. You could start with an overview slide with an ‘x for y’ and brief summary to really explain what they hell you do though. I prefer that. You have the most investor attention in the first minute (and drops off exponentially then) so make sure to get the key bits at the front. I love how they start with how expensive hotels are. I hate having to rely on hotels. I couldn’t be nomadic without Airbnb! This is a pain point I relate to as an investor and a person. The ‘disconnected from culture stuff’ is hippy dippy stuff I don’t care about. It’s like saying you are going to be a B-corp and give profit away to charity. Investors only care if that leads to greater profitability not less (and a fuzzy feeling). It’s not a terrible point though. 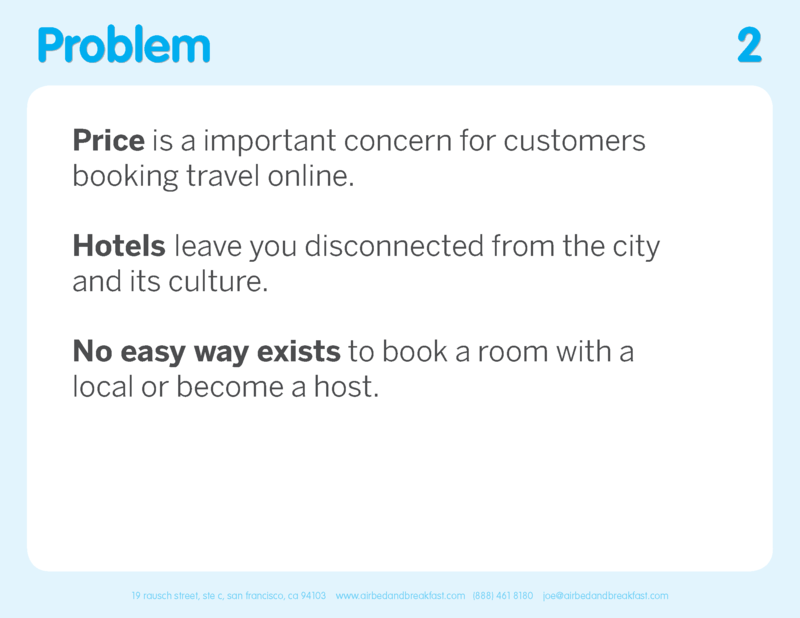 The ending point on booking with a local immediately leads me to guess what their business model is. The ‘no easy way exists’ is a bold statement though. Never tell investors you don’t have competition! In this case the idea is so nuts it’s actually core to the investment thesis. I like how few words they use. It’s to the point. There is a great use of space (seriosuly, more white space will suddenly 10x the appearance of any deck you do! ess is so much more). I’m not sure if ‘web platform’ should be bolded, but that could be time relevant. The world today is different. Could write ‘two sided marketplace’ instead. But doesn’t matter. ‘Space’ could be better termed. Bedrooms might be more apt. One thing to note is the ‘rule of three’ is applied throughout the deck. You can always bucket things into 3. People like three. I learnt this from an MD when I was in M&A. There are 3 problems and 3 solutions. It’s clean and memorable. The font sizing is also apt. SAVE MONEY is the third thing you see, then MAKE MONEY and SHARE CULTURE. Your eyes are then drawn to the subpoints ‘when travelling’ etc. This is a great example of eye path control. Understand how the psychology works and how eyes dart across a slide. Lead investors to how they consume your content. It’s a micro-narrative on each slide. This is simple. Two blocks of text and a heading. I don’t like it, but it is ok. Never ‘label’ slides. Joe is basically filling out a Sequoia like flow template. Your heading should make the point of any slide. 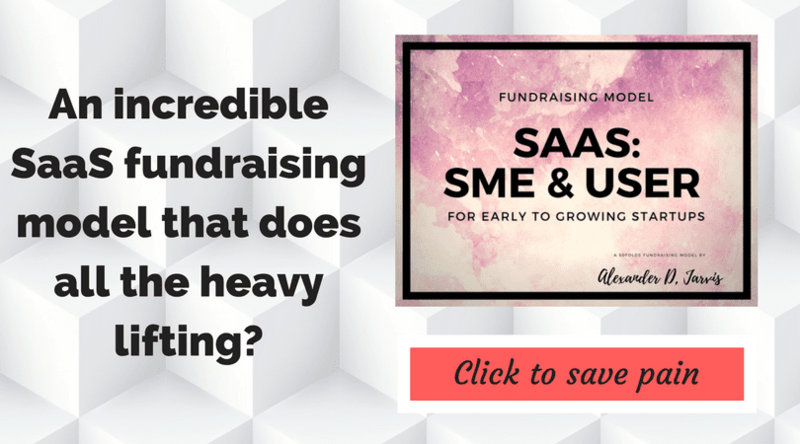 ‘Market is validated by impressive demand in tangential startups‘ or something as an example. Don’t let investors think. Thinking is bad. Do the thinking for them. Tell them what to think. Frame it. Referencing tangential competitors is fab. Showing numbers is brill. You could ideally add a sub bullet point explaining a bit more and providing context (such as why they are not doing the same thing). This is a prototypical TAM, SAM, SOM format. Don’t worry. No one really understands what these terms mean and how to properly do them. If you want to f*** with an investor, try getting them to explain it in detail with an example. Tumbleweeds. Lol. Investors understand one concept, ‘big market.’ I was chatting with one mentee today. He said the investors are passing as the market ‘is only $800m.’ So your market matters. 84m trips is fairly large. So slap on an imaginary booking number and intuitively the market is large. Look, writing decks is a balls. You need to get them done. If you can hack this and illustrate like this, do it. If investors get hung up on how you did a slide like this, then make it better. The slide is decent, but not perfect. But done is better than perfect. I like the fact Joe adds the ‘source’ for each number. So many founders don’t do this. Yes, best practice is to make the source super small. I use font size 8 as default. I normally put the source where the contact details are aligned left. I like how simple this is. Understand investors are shitting all over the concept at this point in time. They don’t need to get super detailed! They needbuy inon the idea not the tech platform. You ‘could’ have 10 steps, but adding more steps makes things feel harder. I learnt this in my behavioural psychology class in university. Make things seem simple and it seems easier to do and plausible. I would make the ‘we take a 10%…’ as the slide headline, but anyway. You want to have ONE business model, not 15 complicated and distracting possible ways of making money! You can talk about the other ways you make money when investors ask. They will ask. But keep simple and make it appeat (at least, ha) that you are focused. The $84m trips is a mistake. That’s a number not a dollar value. 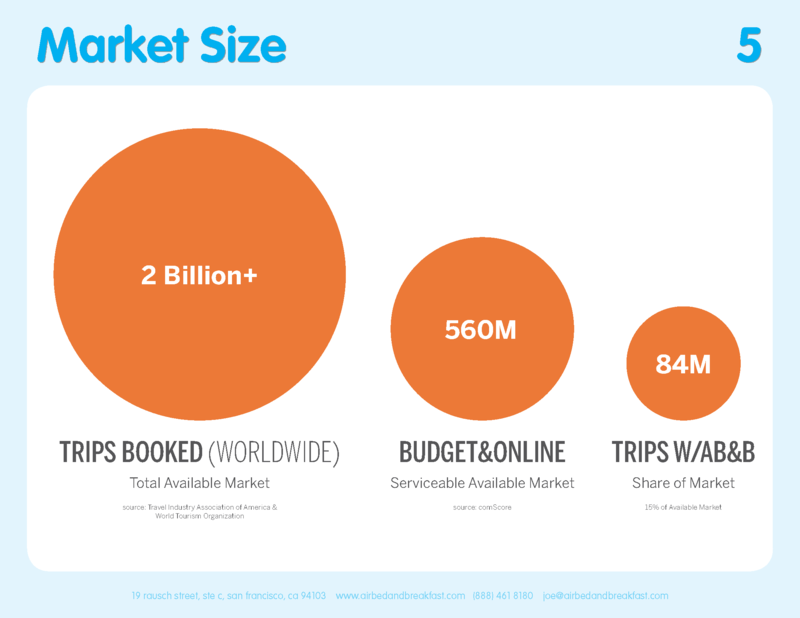 I like the fact they link the business model page to the market size slide with that 84m trips. It creates consistency. The average fee is good. They break out the calculation below (show you assumptions!). It removes a question an investor WILL have. They show the potential for $2.1b revenue. Nice. This is AKA ‘Go to market strategy.’ Yes, investors actually care how you plan on making that $2.1b revenue a year! It’s BS otherwise. Partnerships is blah. Whatever. They haven’t explained on the slide anyway. Events is blah, but they at least list events! This shows some though and makes more plausable. 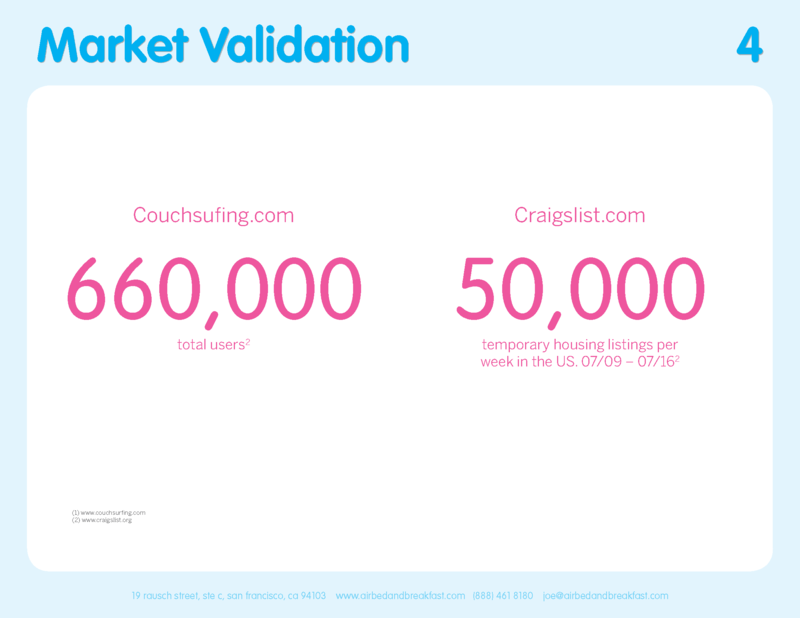 Craigstlist… clearly an amazing growth hack! They got the axis right. You need to think about your axis on your competititor slide. Picking the wrong ones makes it seem like you are selling too much and not logical. I personally like adding some commentary here in call out boxes. It adds narrative, prempting investor thoughts and showing how you think about the competition. I know founders hate writing this slide… Truth is there are only 3 competitive advantages which are truly sustainable. One is a brand (and f*** me that is expensive!). The vast majority that founders write on this slide is total BS. Basically everything they have written is a product feature that can be replicated easily. First mover advantage is often bad. Fast follower is often a good strategy. Market education costs a fricking bomb. Anyway. They innovated. They do list 6 things which don’t soung stupid though. I don’t lauch at this slide. If you don’t really have traction to base your deck around, you need a proxy… PR is one good example. What they did well that most founders don’t do is include the quotes like this. I like it. The quotes help remove some fear they probably had about the business idea. Something is better than nothing. This is just another proof point that the idea isn’t dumb. 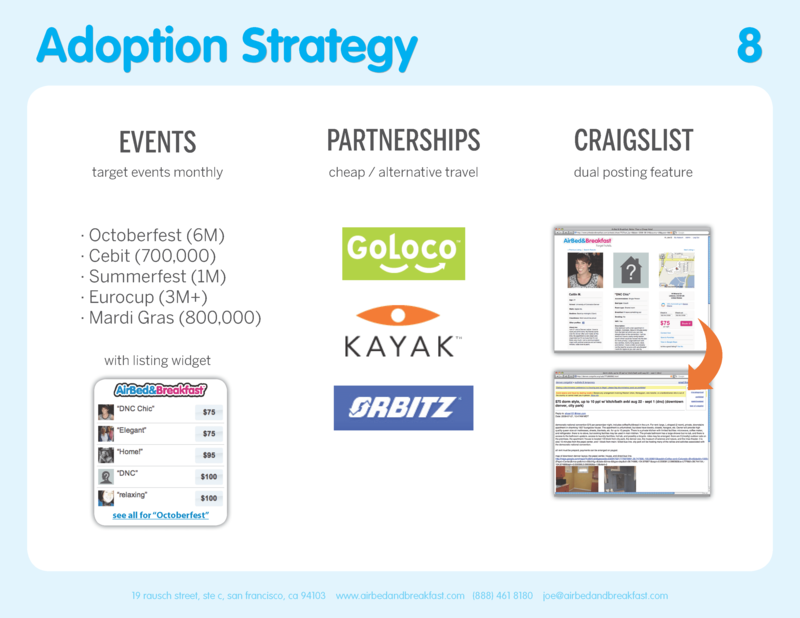 If you have growth metrics you wouldn’t really need this slide. Or it would be appendix material at best. 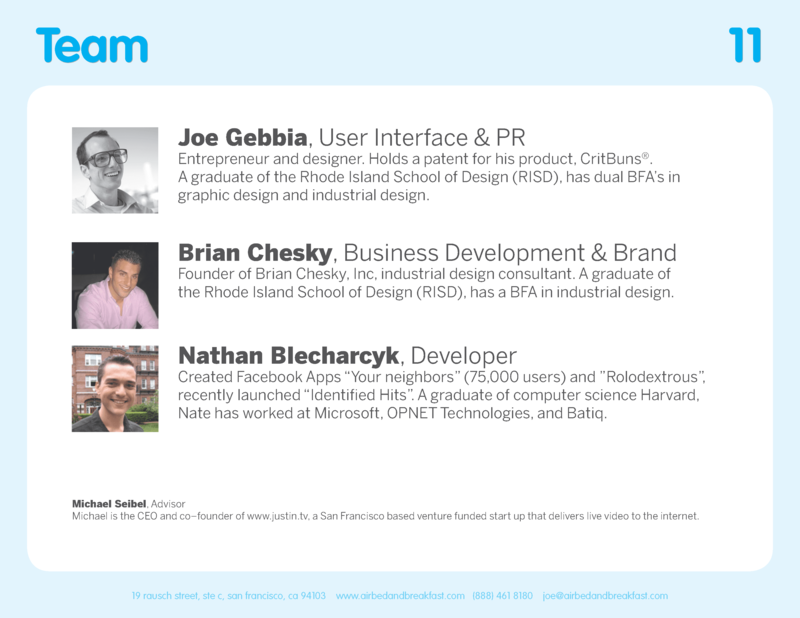 User testimonials talk, numbers walk. This could be better if they had some celebs using it, otherwise the content is fine. My guess is that this is the teaser deck, not the full one. Well could be, I don’t know. There are none of the the typical source and use information (get the free runway calculator here). This slide is basic, but not terrible. I like they state they want 12 months runway and have a clear, singular milestone of 80k transactions. Presumably that is a logical number/milesstone for your series-a?? 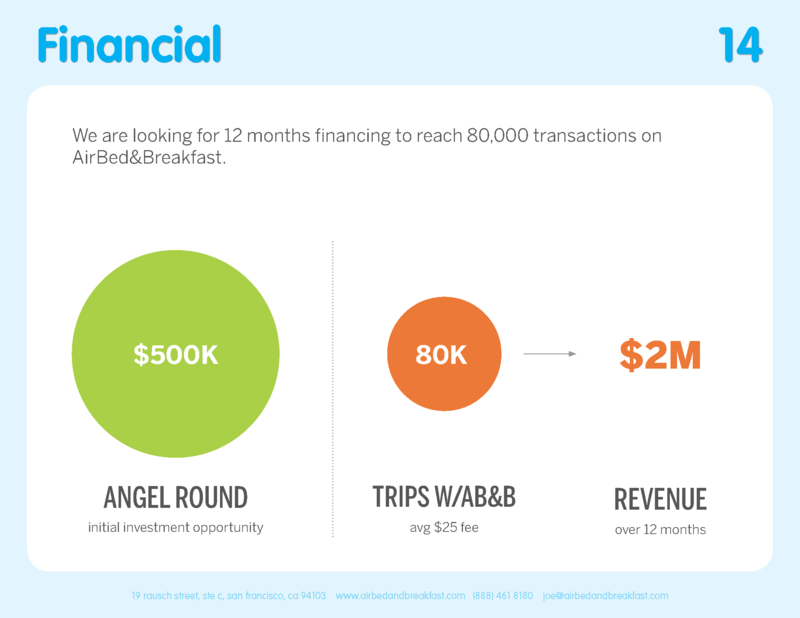 So $500k gets them 80k transactions and $2m revenue. As usual they break out the high level detail, such as average fee and runway. It is nicely structured, if not minimalistic. If you enjoyed the thoughts on this deck, then take the pitch deck thinking course and learn how to think about your pitch deck. Sure, I share the largest collection of pitch decks in the world, but they aren’t the same model as you! So you need to think. Let me help you learn how.